Why I never get anything done… – Hello Korea ! Saturday I had to go to Seoul and try to find bookstores again. When I got home, I had to look for new jobs on-line (there seem to be some options out there) and then this morning I reviewed Korean and went to my Korean lesson in Idae. I had thought Idae was the name of the neighborhood in which Ewha women’s university was located. However, my tutor informed me that “I” is short for “Ewha” (the “I” has a long “E” sound) and that “dae” is short for “daehakyo,” which is the Korean name for university. Similarly, Hongik University is called Hongdae for short. So I was probably counseled by the Vice Principal that I have to wear sleeves because perhaps a bra strap was slightly visible. This all too common occurance that westerners don’t think about that much caused my tutor to gasp and I guess it’s considered very slutty. (even if my neck is covered, every other part of my body is covered, even if I am wearing a gunny sack) sheesh! It was an accident! I told her that was another culture shock thing, and then she relayed how she was traveling abroad and had to switch to wearing only pants, because she was shocked to have western men look at her like she was a prostitute when she wore her mini skirt and high heels out and about. So, I had to run over to Emart and correct the situation. What can I say? I’m a sensualist. And an aesthetic. And a perfectionist. 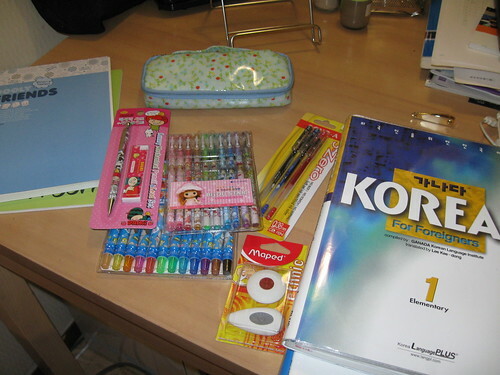 Now, I have a notebook without lines, (incredibly hard to find, btw) a second mechanical pencil so my tutor and I can both write in pencil during the lesson (I had to insist she writes in pencil so I can clean up her scratching later – my first book is totalled now) and pens that are .38 mm wide, (you can’t go back to .7 after you’ve had a .38) and colored pens to underline and highlight with (.38, of course!) erasers that feel good in your hands and have a narrow edge to them, and some crayon-like pencils so I can draw puppets with. Eh, who needs food? Ahhh…NOW I can get to work! But wait! An email from Jane. We are going to Chuncheon next Saturday to work with the artist who made the giant puppets for the protest last weekend. Aside from the every day impossible job, I’m really excited to combine my love of puppets AND activism! Ut oh. On the computer. Must check a few more job openings. Must post this to the blog. Damn it. Quarter after ten and I’ve still got Korean and lesson plans to write. Welcome to my neurotic life! Hey, we use the same Korean book! (Okay, I’m at a different level, but still 가나다) Maybe this means we can study together some time? I completely understand how you feel about people writing in your book, too. My friends did that with one of my other textbooks and – even though it was just on one page – it still drives me nuts thinking about it. Yes, I always like my books to stay pristine, and any rare notes must be legible enough for myself and anyone to read with clarity later! She’s an artist and kind of sketches as she’s thinking, so I just replaced her pen with a pencil and it’s okay, because I can erase it later. I really need to study more Korean handwriting though. The jieuts tend to look like the aids ribbon, the iungs + o or yo looks like an electrical drafting symbol to me, and I lose the “w” sounds in complex syllables. All those places where their pen doesn’t leave the paper but should get tied together into a rolling mess. There are a couple of videos of Korean handwriting on youtube, but one really needs lots and lots of examples for it to make any sense.